Apparently, it was the perfect day for it. My Ferrari track-day had come around all too soon, and nerves were getting the better of me. The sun was beating down, the sky was clear blue and the track bone dry. Perfect conditions, I reassured myself. Yet still, I had a knot in my stomach and my hands were getting sweaty. Stuffing a Ferrari 360? Not good. Stuffing a Ferrari in front of my wife when the results are going to be published in a magazine for all to see? Ultra ‘not good’. I blipped the throttle, delighting in the metallic crescendo of the V8 nestled behind my head. Then, popping it into first and easing on the throttle, I was off. “Take it easy”, I told myself. “Learn the track”. My confidence grew with each corner taken, each apex clipped. This is easy. I’m awesome! Over-confidence. Disaster. The corner seemed to come from nowhere. 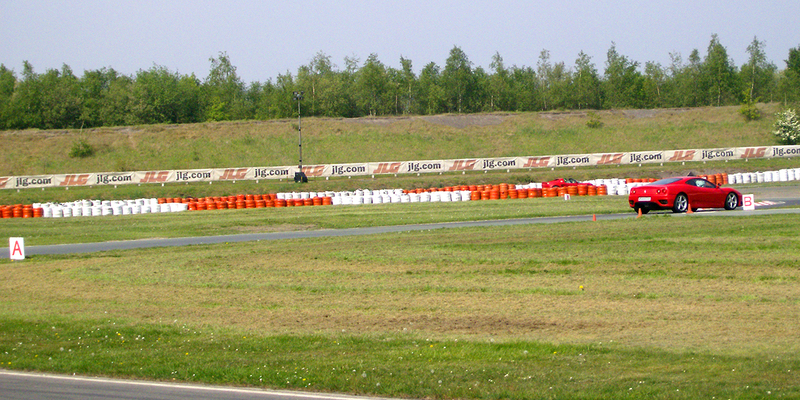 A momentary slip in concentration and I was heading at a wall of Armco and tyres at almost a hundred miles an hour. I’d missed my breaking point; there was no way I could get around the corner or stop. So I did all I could: braked for all I was worth and, when the road ran out, put the passenger side between me and the armco, gritted my teeth and held on for all I was worth. The rear wheels broke traction as they hit the grass and the car slammed heavily into the wall. More than a little shaken, I looked around the stricken 360, surveying the damage. There was quite a lot. It was a damn good job I could press restart. This was supposed to be getting me in the mood. Helping me get the feel of the car, learn how it would corner. Preferably, help me not to stuff a £150,000 car into a wall at high speed. So far, it was totally not working. The Forza games, most certainly not Outrun (nor Gran Turismo due to a serious lack of Ferraris), were my chosen tools of preparation. 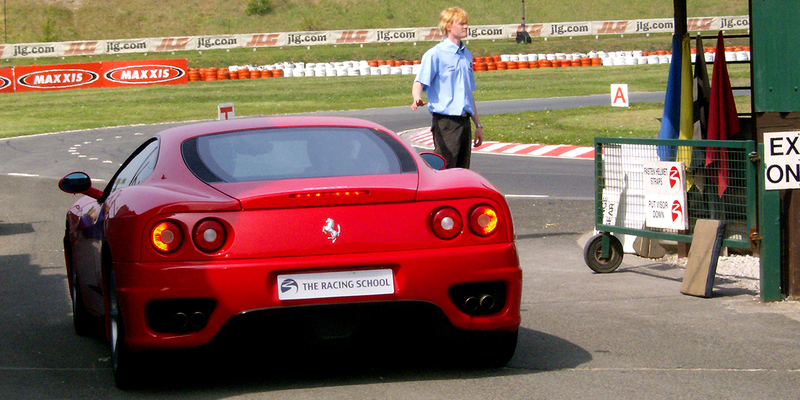 Surely, these po-faced motorsport ‘simulations’ could help me develop the skills to handle a Ferrari 360 in real life? I hoped not. So far they seemed to be playing a digital funeral march, as time after time I stuffed my ride into an assortment of other cars and trackside objects. Was this how a Ferrari really handled? Would the power-oversteer really be that pronounced? Would the suspension really be that hard, that sensitive to the undulations of the track? Was I really just a ham-fisted clown of a driver? Perhaps it was just nerves. Well, I’d soon find out. Visions of bloody, mangled and terribly expensive death plagued me that night. Thank you Forza. Yet, the following morning brought hope. It was a fine day for track driving, the sun was shining, everything was nice and dry and there was only the faintest of breezes. Perhaps I’d actually be coming home in my car, as opposed to the jam jar I rather feared would be my carriage. My wife did her usual, inspired, job of calming me down. “Don’t worry, you’ll be fine. Just enjoy yourself”. Excellent, just what I needed. “Just don’t crash it, according to the damage waiver we’d have to pay the excess. And it’s £2,000”. Great. Cheers, love. Not at all what I needed. Still, off we set for Wigan (the home of Three Sisters racetrack, the venue for my Ferrari ‘experience’), with me in an ever-increasing state of nervous dishevelment. In a Ferrari, quite literally about to die. A couple of hours later, after signing a liability waiver (if you loose your legs, life, lungs whatever, it ain’t our fault – so no suing), I’m twitchily drinking coffee in the clubhouse with a number of other victims (sorry, fellow participants) as we await our safety meeting. In strides our instructor, all brogues, beige trousers and clipboard. He leads us through to the ‘classroom’, and proceeds to talk us through the various aspects of track-safety we need to observe. It’s all terribly obvious (don’t drive like a moron, let the faster single-seaters pass) and ever-so-slightly boring, as if Tiff Needel had been half-bred with a geography teacher. However, then I get fascinated. With the aid of a large diagram (naturally), he begins to talk us through how to take a corner, where to brake, where to turn, where to accelerate. I know this. I already know everything he’s telling me. Don’t brake while you’re turning, turn the wheel and hold from the turn point to the apex then power out and use the full track width. The guy next to me looks even more nervous than me, and bemused. Questions follow as people try and get the procedure in their heads (no, you don’t turn at the brake point). My confidence builds, the funereal trumpets sounding indistinctly in my memory. I smile inside. And probably outside. Thank you Forza. Vague confidence is hesitatingly replacing my early trepidation. Driving games have trained me for this, honed my cornering skills, taught me where and when to brake. The horrific visions of last night are banished. I’ll be awesome. It’s time. Mr Beige leads us and our spectators to the pit-lane. There, waiting to be driven, and driven hard, are two beautiful, gleaming… Mini Coopers? What the hell? ”You’ll be going out in these first” announces Mr Beige, gesturing to the Minis. “I’ll be driving, you just listen carefully and pay attention to the cornering techniques”. Great. Minis. I don’t care if they are the ‘Cooper S’ variants, I’ve played every racing game going, and those things are slow. My crescendo of excitement wilts somewhat. Worse is to come. As one of the last names on the list, I have the privilege of watching everyone else go first, tyres squealing around the corners like the lads on my local Tesco’s car park of a Saturday night. It really doesn’t look very fast. As the Minis return, my fellow racers shakily get out, each looking progressively whiter than the last. The big girl’s-blouses. What’s wrong with them? They’re just Minis. Eventually, beige-racing-man gestures to me and I clamber in, hauling my not insignificant frame into the confines of what appears to be a Tonka toy. “Fasten your belt”, he demands and trundles up to the end of the pit-lane. Yeah, fasten my belt. Right. As if I need to OH MY WORD CAN YOU STOP I THINK MY STOMACH FELL OUT? Lurching, bucking, sliding, wheels-lifting-off-the-floor terror ensues. It looks quite fast now. The scenery swims, my stomach churns and all I can think is “we’re going to tip, this car shouldn’t go this fast”. All the while, Mr Beige is calmly explaining the technique for each corner, getting faster and faster with each lap, to the point where, on one particularly nasty right-hander, the rear driver’s side wheel tastes air and I swear the car is going over. Somehow, we survive and return to the pit-lane. Whoever coded the Minis in Forza is an idiot. They are, most definitely, not accurate to life. Staggering from the car and resisting the urge to kiss the ground, I await my turn in one of the Ferraris. The nerves return, as do the visions of wall-impacting doom. Thanks Mr Beige. Swifter than expected, it’s my turn again. ‘My’ 360 rumbles into the pit-lane. Again, they haven’t looked that fast from the track-side but, thanks to my ‘Mini experience’, my buttocks are now well and truly clenched. There’s even a modicum of anticipatory brow-sweat. The first thing that hits me is how achingly beautiful the car is. Much more so than even the best computer model could convey. Wonderfully proportioned, sparkling red in the late morning sunshine, I suddenly realise just how little videogames have prepared me for this. Giving it the beans. Even more fun than you’d think. The second thing that hits me is how small the damn thing is. Particularly how low. Contortions ensue, and after a little concerted effort, my ample frame is squeezed down into a cockpit designed for short, skinny, Italian millionaires. Not giant, weight-lifting meat-heads with a soft-spot for an ale or two. At least it’s the paddle-shift version, I dread to think how cramped that footwell would be with a clutch pedal installed too. After a couple of minutes finding my way around the controls and receiving some more instruction from another Mr Beige (do they breed at race-circuits? ), we head out of the pit-lane. The first lap is taken steadily. Brake in a line, hit the apex, squeeze the throttle don’t jab it – all the while Mr Beige MkII’s words calmly direct me around the track, helping me to build confidence. This is kind of like Forza. But the Ferrari wants to go. I can feel it straining at the leash. “Okay,” says Mr Beige MkII, “start pushing on.” Right you are, boss. The first corner taken at speed is an education. Videogames are crap. Where’s the manic oversteer? Where’s the engine whine? This car won’t oversteer, burying the throttle just results in more grip and corners taken at speeds that would see me quickly pressing ‘restart’ in a game. And the noise. Oh my word, the noise. This isn’t the whiny, 5.1 sound effect I’m used to. This is Thor, gargling gravel in a canyon. While on fire. And it’s right behind my head. Then there’s the terror. No matter how vital the race, no matter how fast the car, videogames just can’t convey that sense of “Gaaah! I’m going to die! Oh crap, oh crap, oh crap…”, and the sudden gush of maniacal relief as somehow you don’t die and the tyres find purchase, dragging the car through the corner. Basically, if you’re after Top Gear style sideways-thrills, you really do have to drive like a moron. Hmm. Not impressed, simulation-games. Not impressed at all. All too soon it’s over. Half a dozen laps of squealing, wailing, banshee-howl adrenaline rush leave me a slightly sweaty, trembling and grinning mess. But I feel like a hero. No fiery, Armco ensconced death for me. No jam jar ride home and, more crucially and much to my wife’s relief, no insurance excess to pay.